In preparation for The Legend of Zelda: Breath of the Wild, I’ve decided to play through all the main series Zelda games (all of them that have an official placement on the timeline) in release order. What this means is starting with the original game, The Legend of Zelda on the NES. I think Zelda 1 (as I’ll be calling it to distinguish it from the series as a whole) is the hardest game for me personally to put into perspective. It released in America back in 1987, years before I was even born, and I didn’t really get to play video games until long after that. It was only after completing eight or so other games in the franchise (the exact order I played these in escapes me) that I first played it, and while it did establish a lot of what the series would do moving forward, it’s also drastically different from the direction the series took from A Link to the Past onward. The other reason it’s so difficult to place Zelda 1 in context is due to how Nintendo handles continuity. The company didn’t really start paying attention to lore until after Ocarina of Time, and didn’t nail down an actual timeline for everything until Skyward Sword’s release. What this means is that Zelda 1 and later Zelda games have a weird symbiotic relationship. 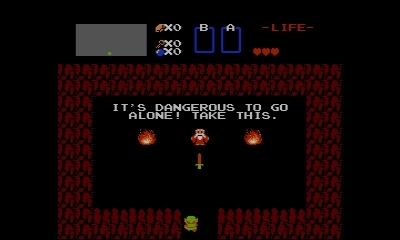 Much of the series has taken its cues from Zelda 1, particularly A Link to the Past, Oracle of Seasons, and Breath of the Wild. However, as the lore has developed and become more fleshed out, these games Zelda 1 has informed also color the perception of it, retroactively adding to its lore. So basically, this is how I experienced Zelda 1 on this recent playthrough. Zelda 1 may have originally been a game about setting off and being an explorer, but viewed through the current lens, it’s the story of a broken, savaged world. This takes place in what Nintendo has dubbed the “Era of Decline,” in which the Triforce of Courage has been lost and no hero has risen up to save Hyrule. Ganon’s minions have overrun everything, and while there may still be people hiding away somewhere in the world, Link’s only allies come in the form of an old man, an old woman, and a shopkeeper, all dwelling in caves, hiding away from monsters. This line makes it clear that this is not just a world of whimsy and adventure. It is a perilous world fraught with danger. He will have no friends to aid him on his quest, so he has no choice but to go alone. The sword the old man offers is one of the few ways he’ll be able to protect himself. This is the story of Zelda 1, at least to me. It’s the sense of atmosphere I’ve gotten from it by comparing it to other Zelda games. And it may be revisionist. It may not be how you experienced the game or how those playing it upon its release would have experienced it. But the beauty of the game is that the story is sparse enough that players are able to claim ownership of what it means in their own way. Since Zelda 1 is all about being dropped alone and lost into and uncaring world for you to explore, I decided I’d play it as close to how it would’ve been played back in the day. It wasn’t a true authentic experience, of course. I don’t own an NES so I played it on the Virtual Console. And while I would have loved mapping everything out, as kids back in the day may have, I was already way too familiar with the map. After all, it’s used for Adventure Mode in Hyrule Warriors (which I’ve played frequently lately), plus it’s on my wallet. I know the topography of Hyrule pretty well. What I did decide to do, however, was try as hard as I could not to use any sort of guide. When I first played the game, I did so glued to a walkthrough, and since the game was pretty tricky, I took advantage of the emulator I was playing on and used save states. I wanted to test myself a bit more this time, so even though the 3DS Virtual Console has a save-state function, I didn’t use it. I did, however, break my rule about guides just a few times: to find the 2nd dungeon (no clue how I had so much trouble with that one), to find the blue ring, to speed up the process of finding the Magical Sword, when I got lost in the 7th dungeon, and to make short work of Death Mountain, since I just wanted to be done at that point. It ended up being easier than I expected. Sure, there were some difficult parts, but I was able to do almost all the dungeons without a guide, even finding all the items in them (minus the Magical Key). I was never even really strapped for rupees. Through some combination of luck and a good memory, I was able to find most the necessary items and even hit the dungeons in the right order. This sounds obvious unless you know that in Zelda 1, pretty much the entire map is open right away and the only thing stopping you from taking on any random dungeon first is that the 4th Dungeon contains an item essential to progressing in many later dungeons. That said, it wasn’t, by any means, easy. Early in the game, you’re so vulnerable to the overworld enemies that just reaching your destination is a difficult task. On top of that, some of the dungeons themselves were incredibly difficult, with three of particular note. The 5th dungeon contains a few rooms with multiple blue darknuts, which are awful to deal with, especially if you don’t already have the Magical Sword. The 6th had tons of wizzrobes, which made me wish I was dealing with the darknuts again. And the 8th dungeon was, of course, a nightmare, with not only plenty of darknuts and wizzrobes, but Gohma making another appearance, three whole appearances of Manhandla, and the most difficult duel with Gleeok (which, surprisingly, was relatively simple). That said, I had a blast with it. It was tough, but never too tough. Every time I beat a new dungeon, I felt like I had actually accomplished something…especially the aforementioned 5th, 6th, and 8th dungeons. The biggest thing I noticed in terms of how different it was from later games is how little emphasis is placed on puzzles. It’s all about exploration. Sure, the dungeons and even the overworld itself are labyrinthine, but it can all be solved with simple mapping. There are only a few recurring puzzles in the first Legend of Zelda: pushing blocks, bombing walls, defeating enemies, and using the stepladder to cross certain areas. There are a few more puzzles that are required for progression in the game, but they only show up once or twice. The focus is solely on action and adventure. Ultimately, it was a rough playthrough, but one that, in retrospect, I’m glad I did. I actually loved Zelda 1. It was different, sure, but it was also similar enough that I loved playing it. One I would definitely recommend to fans of the 2D Zelda games. I think I’d also recommend it as a good starting point for anyone looking to get into the series (assuming they’re looking for a bit of a challenge). Not much of a list, but it has to start somewhere.